Always wanted to tread the boards and be involved with an award winning amateur musical theatre group? Well why not take advantage of our special offer where you can get your first month of rehearsals FREE! Contact Us now to book your FREE taster session! 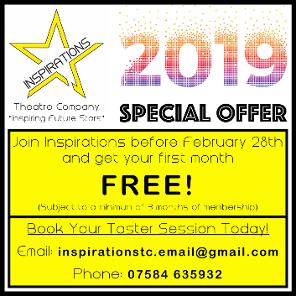 Inspirations is on the move to a brand new rehearsal venue that is offering us lots more options and flexibility to be able to continue to provide the opportunities we do ! Tickets For Our 20th Anniversary Productions On Sale Here. 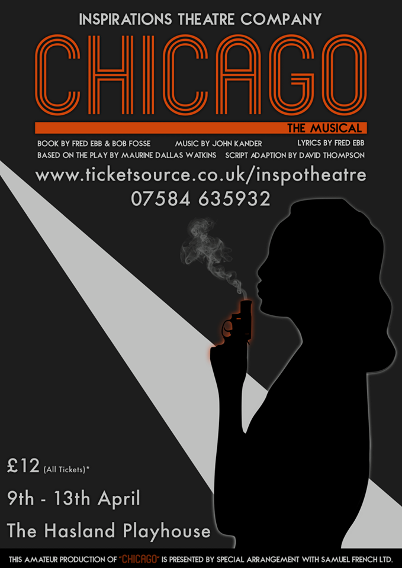 The legendary hit musical Chicago comes to Chesterfield for 1 week only! Set in the 1920’s and based on real murders and trials, we follow Roxie who murders her lover and is arrested. In jail she meets double-murderess Velma. When both acquire the same lawyer, Billy Flynn, tensions come to ahead as they both vie for the spotlight. Featuring such musical theatre song staples as; ‘All That Jazz’, ‘Mister Cellophane’, and ‘The Cell Block Tango’. Price includes booking fee and a full colour show programme. Don't miss your chance to see this specially licensed production which is not usually available to amateur groups! READ OUR RECENT 5 STAR REVIEWS HERE! The Eagle Club, St. John's Road, Newbold, Chesterfield, S41 8QN. Interested? Why not enjoy a FREE taster session at either evening and see if we are the right place for you! Just go to our 'Contact Us' page and send us a message stating when you would like to attend and we will happily welcome you along. All teachers have Advanced DBS Checks and hold up to date Chaperone Licenses as official Derbyshire County Council Representatives. We also have strict Safeguarding, Equality and Health & Safety policies in place for you/your child's protection. Inspirations Theatre Company Limited is a not-for-profit organisation. Company limited by guarantee with no share capital, registered in England and Wales.